AED location and signage is important to be sure your AEDs are accessible and ready when needed. Remember to provide signage. Time is of the essence in an emergency. Visit our AED Packages for colleges, universities or schools to see some recommendations. Remember that outside soccer, baseball and football fields may need waterproof cabinets, and we offer a complete line of cabinets. Keep the AED out of the direct sun and under awnings, if possible. Most AEDs should be kept between 32 and 120 degrees, because extreme temperatures shorten battery life. Use completely waterproof cases for outdoor use to protect your investment. Visit our Ten Tips for Implementing an AED Program for suggestions on best practices for an AED Program. It should be no question as to why a school should have emergency response kits on site. It seems like barely any time passes between incidents involving an active shooter. Between 2000 and 2013, 24% of active shooter incidents took place at a school or learning institution, according to the FBI. In the time it takes for EMS to arrive and be cleared onto the scene, Tramedic® trauma kits can be used to save lives. 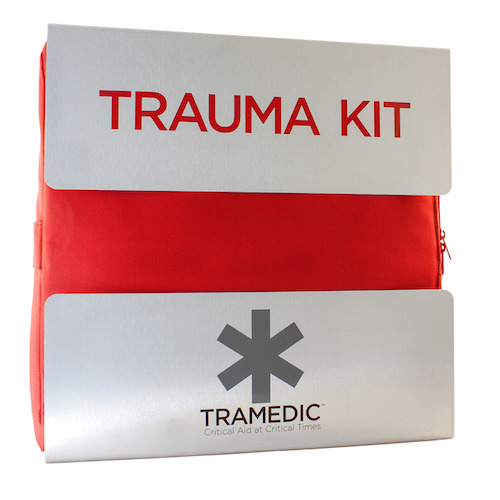 Tramedic® kits contain the supplies needed to treat a variety of injuries and the instructions are easy to follow. Tramedic® also includes licenses to their training portal, where videos detail the components of each supply.